Sixty years after the publication of Orwell’s masterpiece, Nineteen Eighty-Four, that crystal first line sounds as natural and compelling as ever. But when you see the original manuscript, you find something else: not so much the ringing clarity, more the obsessive rewriting, in different inks, that betrays the extraordinary turmoil behind its composition. 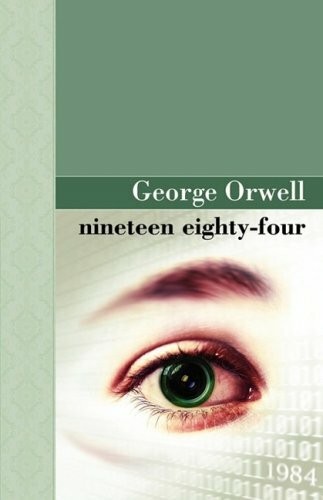 The circumstances surrounding the writing of Nineteen Eighty-Four make a haunting narrative that helps to explain the bleakness of Orwell’s dystopia. Here was an English writer, desperately sick, grappling alone with the demons of his imagination in a bleak Scottish outpost in the desolate aftermath of the second world war. The idea for Nineteen Eighty-Four, alternatively, "The Last Man in Europe", had been incubating in Orwell’s mind since the Spanish civil war. His novel, which owes something to Yevgeny Zamyatin’s dystopian fiction We, probably began to acquire a definitive shape during 194344, around the time he and his wife, Eileen adopted their only son, Richard. Orwell himself claimed that he was partly inspired by the meeting of the Allied leaders at the Tehran Conference of 1944. Isaac Deutscher, an Observer colleague, reported that Orwell was "convinced that Stalin, Churchill and Roosevelt consciously plotted to divide the world" at Tehran. Orwell had worked for David Astor’s Observer since 1942, first as a book reviewer and later as a correspondent. The editor professed great admiration for Orwell’s "absolute straightforwardness, his honesty and his decency", and would be his patron throughout the 1940s. The closeness of their friendship is crucial to the story of Nineteen Eighty-Four. Orwell’s creative life had already benefited from his association with the Observer in the writing of Animal Farm. As the war drew to a close, the fruitful interaction of fiction and Sunday journalism would contribute to the much darker and more complex novel he had in mind after that celebrated "fairy tale". It’s clear from his Observer book reviews, for example, that he was fascinated by the relationship between morality and language. There were other influences at work. Soon after Richard was adopted, Orwell’s flat was wrecked by a doodlebug. The atmosphere of random terror in the everyday life of wartime London became integral to the mood of the novel-in-progress. Worse was to follow. In March 1945, while on assignment for the Observer in Europe, Orwell received the news that his wife, Eileen, had died under anaesthesia during a routine operation. Now Astor stepped in. His family owned an estate on the remote Scottish island of Jura, next to Islay. There was a house, Barnhill, seven miles outside Ardlussa at the remote northern tip of this rocky finger of heather in the Inner Hebrides. Initially, Astor offered it to Orwell for a holiday. Speaking to the Observer last week, Richard Blair says he believes, from family legend, that Astor was taken aback by the enthusiasm of Orwell’s response. It was a risky move; Orwell was not in good health. The winter of 194647 was one of the coldest of the century. Postwar Britain was bleaker even than wartime, and he had always suffered from a bad chest. At least, cut off from the irritations of literary London, he was free to grapple unencumbered with the new novel. "Smothered under journalism," as he put it, he told one friend, "I have become more and more like a sucked orange." Ironically, part of Orwell’s difficulties derived from the success of Animal Farm. After years of neglect and indifference the world was waking up to his genius. "Everyone keeps coming at me," he complained to Koestler, "wanting me to lecture, to write commissioned booklets, to join this and that, etc.  you don’t know how I pine to be free of it all and have time to think again." On Jura he would be liberated from these distractions but the promise of creative freedom on an island in the Hebrides came with its own price. Years before, in the essay "Why I Write", he had described the struggle to complete a book: "Writing a book is a horrible, exhausting struggle, like a long bout of some painful illness. One would never undertake such a thing if one were not driven by some demon whom one can neither resist or [sic] understand. For all one knows that demon is the same instinct that makes a baby squall for attention. And yet it is also true that one can write nothing readable unless one constantly struggles to efface one’s personality." Then that famous Orwellian coda. "Good prose is like a window pane." At first, after "a quite unendurable winter", he revelled in the isolation and wild beauty of Jura. "I am struggling with this book," he wrote to his agent, "which I may finish by the end of the year  at any rate I shall have broken the back by then so long as I keep well and keep off journalistic work until the autumn." The locals knew him by his real name of Eric Blair, a tall, cadaverous, sad-looking man worrying about how he would cope on his own. The solution, when he was joined by baby Richard and his nanny, was to recruit his highly competent sister, Avril. Richard Blair remembers that his father "could not have done it without Avril. She was an excellent cook, and very practical. None of the accounts of my father’s time on Jura recognise how essential she was." Michael Savage Poses No Risk to British Security So Why Won't MPs Say So?